Distribution and habitat: Rhododendron simsii is native to East Asia, where it grows at altitudes of 500–2700m (1600-9000 feet). It is a shrub that grows to 2m (6.5 feet) in height, with leaves that are ovate, elliptic-ovate or obovate to oblanceolate. Flowers range from white to dark red. 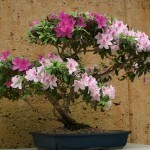 Description: Rhododendron simsii is of the two species of Rhododendron that can be grown as indoor plants. 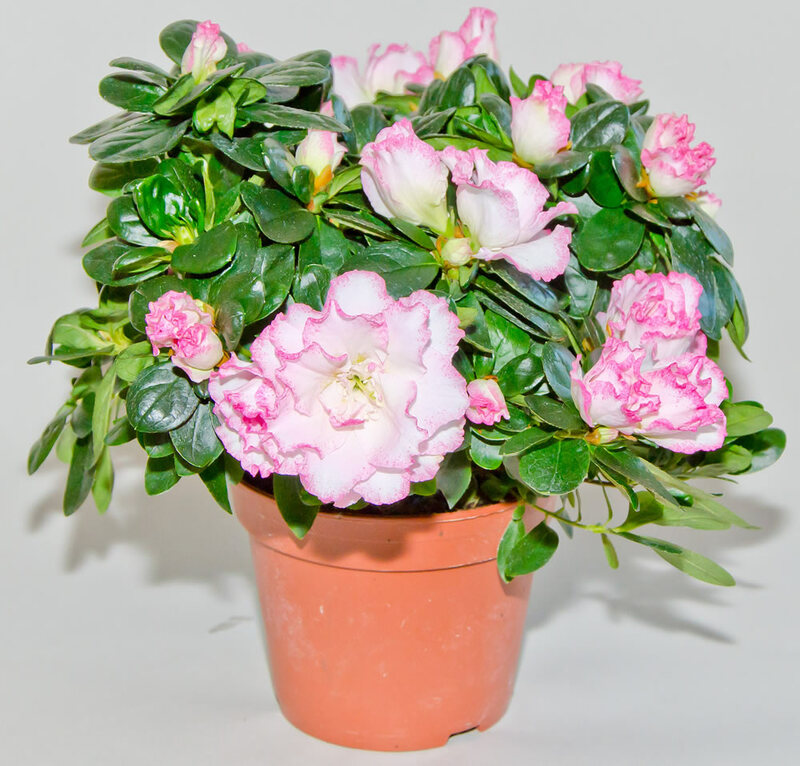 Rhododendron simsii grown indoors are almost invariably hybrids of mixed parentage and are all small shrubs rarely more than 45cm (18 inch) in height and spread and they have 2-3cm (0.8-1 inch) long leathery, generally egg-shaped leaves. Funnel-shaped flowers are borne at the ends of the stems. Rhododendron simsii hybrids are the large-flowered specimens. 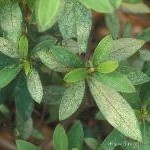 The leaves are sometimes glossy, but practically all varieties have some bristly hairs on leaf margins. Flowers are carried in small clusters of two to five; each flower is 4-5cm (1.5-2 inch) across and may be single or double, sometimes with ruffle petals. The colours of flowers are white, magenta or any pink shade and sometimes they are attractively bicoloured. Their flowers are often lasting several weeks. 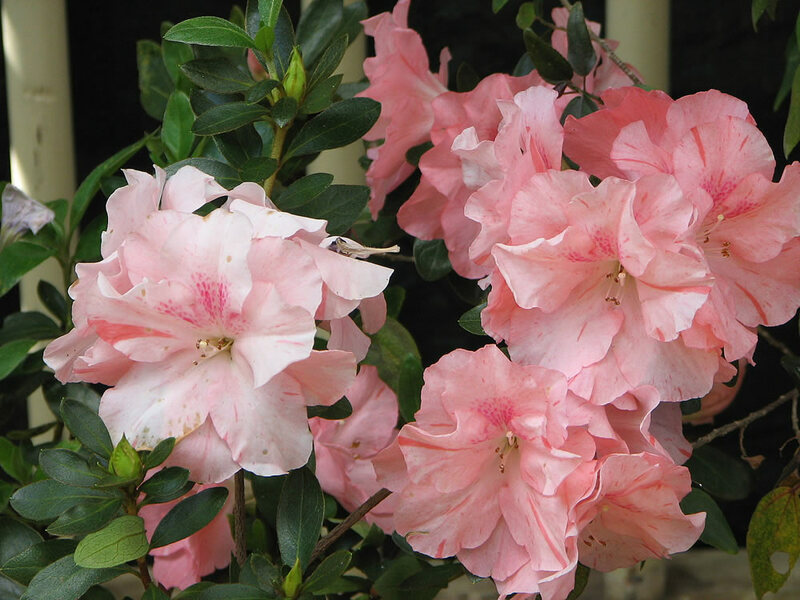 With proper care, Rhododendron simsii in bud stage can give up to six weeks of enjoyment. Rhododendron simsii in bloom provide two to four weeks of beauty. Houseplant care: These hybrid forms are usually grown indoors for a single season as temporary winter and early spring flowering plants, but it is possible to keep them alive and attractive for several years under the right conditions. It is useful if the plants can be taken outdoors for a few months each year on a well lit verandah or balcony. In their natural state they will flower in mid-spring, but commercial growers generally start batches of plants into growth at different times to produce a succession of well budded plants that will bloom at various periods from early winter well into spring. The larger the plant, the more easily it is carried over into another year. Most young specimens have been removed prematurely from nursery beds, have had their roots pruned and have been packed into small pots. Thus, often they cannot tolerate the treatment that is necessary for them to continue growing and flowering in subsequent years. 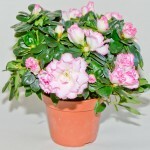 Light: Potted Rhododendron simsii in bud or bloom should be placed in bright light but out of the direct sunlight. When not flowering, they do best if given only medium light, as at a sunless window, although a brightly lit position in a cool room is also suitable. Temperature: Keep these plants in as cool position as possible, preferably 7-16°C (45-61°F). If the Rhododendron simsii are brought into warm rooms – above 20°C (68°F) – the roots will dry quickly, flower will flop and leaves will fall. Move the plants gradually from cool into warmer positions if absolutely necessary, but flower will last longer if they are kept cool. 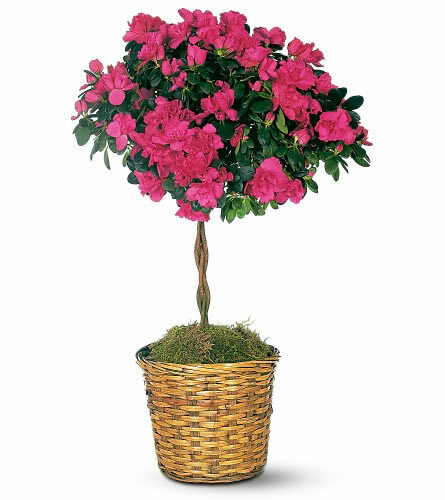 Watering: To make sure that indoor grown Rhododendron simsii are permanently moist at the roots (they are almost always potted in pure peat moss) water them plentifully, giving enough at each watering to keep the potting mixture thoroughly moist. They dislike lime, so use soft, lime-free water. Stand pots on trays or saucers of damp pebbles for extra humidity. Another way to provide extra humidity for a potted Rhododendron simsii is to stand it in a larger pot of peat moss kept moist. Feeding: Apply a lime-free liquid fertiliser once every two weeks from late spring to early autumn. How to keep these plants for more than one season: Although it is not possible to retain these plants for any longer than one season entirely indoors, they can be kept indefinitely in the right circumstances. When flowers are faded, place the plants in the coolest possible position, water them moderately – enough to make the potting mixture moist throughout, but allowing the top centimetre (0.4 inch) or so of the potting mixture to dry out before watering again and put them outdoors on mild days. In cool or cold climates, wait until any danger of frost has passed. Stand them in the shade outside, preferably with the pots sunk into the ground – only if the soil is low in lime. Keep each such plant moist, spray with clear water on hot evenings and feed with lime free fertiliser. 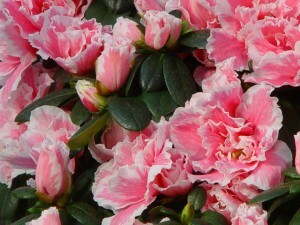 Then bring them indoors for another flowering season just as winter begins. 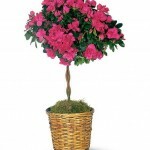 Once more, keep the potted plant cool while buds develop; hot, dry air will cause buds and possibly leaves to drop off. A cool conservatory or glasshouse at 7-13°C (45-55°F) is ideal at this stage. From the beginning of the flowering period until the flowers fade, brighter light and more warmth – though not temperatures above about 21°C (70°F) – become tolerable to the plant. Potting and repotting: Use a lime-free combination of one part of soil-based potting mixture, two parts of peat moss and one part of coarse sand or perlite. Plants should be transplanted to pots one size larger every two or three years, after flowering but before being moved outdoors. Propagation: Rhododendron simsii can be propagated by means of tip cuttings of new growth taken in spring. Plant a 5-8cm (2-3 inch) long cutting in an 8cm (3 inch) pot of moistened rooting mixture consisting of two parts of coarse sand or perlite and one part of peat moss. Enclose the potted cutting in a plastic bag or propagating case and keep it in a shady position. When the cutting is well rooted (in about 8-12 weeks), transplant it to an 8cm (3 inch) pot of the potting mixture recommended for mature plants. Thereafter, the plants may be treated as a mature Rhododendron simsii. Yellow leaves is an indication of either an iron deficiency or the presence of lime in the potting medium or water. Treatment: To counteract this, water with a sequestrene compound (a solution of iron chelates). Water the plant with soft water. Leaf drop or shriveling is most often caused by dry soil. Other common causes are too-low humidity, too-high temperatures and too much sun exposure. 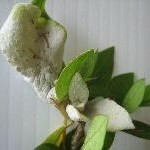 If the plant has lost more than one-third of its leaves, discard it because it will never recover. Treatment: Submerge the pot in room-temperature soft water, until the potting medium is thoroughly saturated (bubbles disappear), every day for a week and never allow it to dry out again. Brown leaves can be an indication of root rot caused by soil-borne fungi. Infected plants should be discarded. Spider mites are the most common pests and infestations occur when the air is too warm and/or too dry. 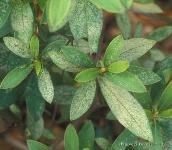 Parched or crinkled leaf tips, with webbing on leaf undersides, is a sign of spider mites. 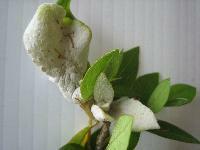 Treatment: Prune infested stems, but if more than one-third of the plant is infested, discard the plant. Re-blooming: Unless the winters are short and mild, Rhododendron simsii plants are difficult to get to rebloom (unlike the hardy garden Rhododendrons/azaleas). Enjoy Rhododendron simsii plants as long as their flower bouquets last. Notes: The genus name ‘Rhododendron’ is derived from the Greek ‘rhodon’ meaning rose and ‘dendron’ which means tree, so ‘Rhododendron’ is the Roses Tree. Rhododendron is a member of the Ericaceae (heath plant) family. Relatives include Erica (heath plant), Calluna (heather), Gaultheria (salal, lemonleaf, wintergreen) and Vaccinium (huckleberry, blueberry, cranberry). 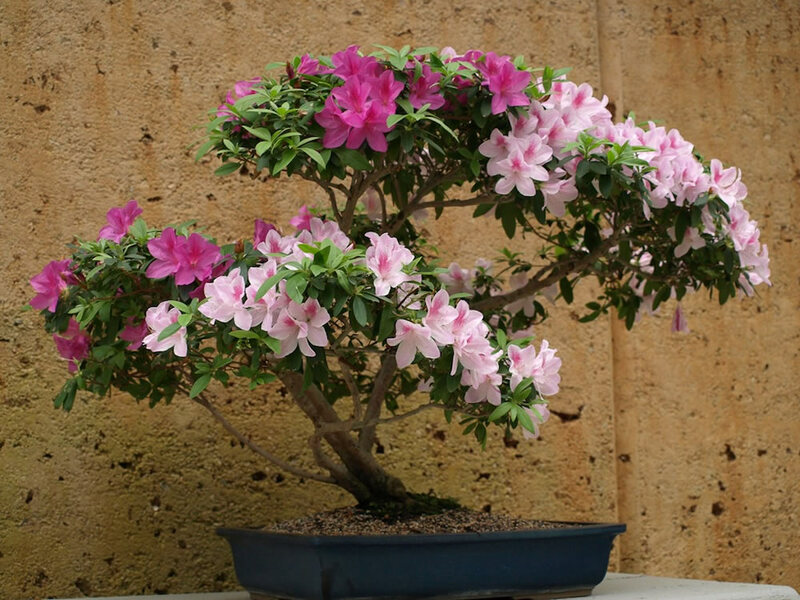 Uses: This beautiful flowering shrub is able to combat formaldehyde from sources such as plywood or foam insulation. Because Rhododendron simsii does best in cool areas around (60 to 65 degrees), it is a good option for improving indoor air in basement if can be provided with a bright spot.